For fans of Deepak Chopra, Rudy Tanzi, and Andrew Newberg. A renowned behavioral neurologist provides insights to some of the most curious spiritual questions we all face. It’s a question billions of people have asked since the dawn of time. You would think by now we’d have a satisfactory, universal answer. No such luck…Or maybe we do and we just need to look in the right place. For Dr. Jay Lombard that place is the brain, and more importantly the mind, that center of awareness and consciousness that creates reality. 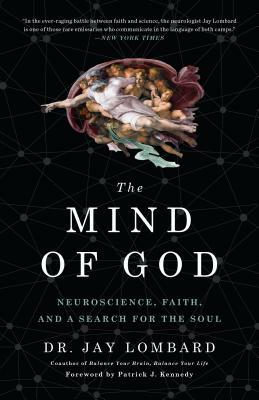 In The Mind of God, Dr. Lombard employs case studies from his own behavioral neurology practice to explore the spiritual conundrums that we all ask ourselves: What is the nature of God? Does my life have purpose? What's the meaning of our existence? Are we free? What happens to us when we die? For Lombard, these metaphysical questions are a jumping-off point for exploring the brain in search of the seat of the soul. It is neuroscience, the author contends, and how we and our brains interpret what’s going on around us that can lead us to a deeper and more fulfilling faith. Mixing his personal experiences in the medical field (including compelling cases such as the male patient who really thought he was pregnant and a woman who literally scared herself to death) along with his own visionary insight into spiritual experience, Lombard has much to tell us about the nature and power of belief—and what we can do to focus our beliefs in a positive direction. If you want to find more meaning in your life or are searching for a deeper understanding of why we believe what we believe, then this book can lead to an exciting transformation in the way you see and understand the world around you. With cutting-edge research and provocative case studies, renowned behavioral neurologist provides insights to some of the most curious spiritual questions of mortality. Dr. Jay Lombard, a Board-certified Neurologist, is the co-founder, chief scientific officer, and medical director for Genomind, a precision medicine company for patients with psychiatric and neurological conditions. The company is committed to discovering the underlying causes of neuropsychiatric disorders, and supports the development of personalized medicine for clinical practice. Dr. Lombard has developed a genetic diagnostic test, and has been granted several patents for biomarker diagnostics in psychiatry and neurology. The technology he developed has been regarded by several key opinion leaders as one of the most significant breakthroughs in psychiatry.